Introducing artwork adds to the allure of a hospitality venue and works to enhance the captivating appeal of any setting. Designers and hoteliers are now taking into careful consideration the type of artwork they choose for their establishment and just how this can impact on the distinctive feel of the space. We caught up with Managing Director of leading art consultants, ARTIQ, Patrick McCrae, to find out what trends we’re likely to see for hospitality art and why it’s on the up. What key themes are trending this year for hospitality artwork in your opinion? Interestingly, art behaves similarly to the fashion industry in times of social and political uncertainty, in that tastes tend to swing towards what is known, with even a pinch of nostalgia added in. In the luxury boutique market therefore, we have seen an appetite for illustration and original vintage items, curating a collection of retro film posters for The Great Northern Hotel in London’s King’s Cross, as well as over 300 beautiful book illustrations and architectural drawings for the recently-refurbished rooms and corridors at The Gleneagles Hotel in Scotland. The second major trend has been the salon hang, where pictures are displayed alongside and above one another in the manner of the great European salons of the 19th century – or as they are indeed still hung in the Royal Academy’s annual Summer Show. This enables hotel owners to select relatively inexpensive art, which when grouped (artfully!) en masse, achieves a bespoke and high-visual impact, with guests’ eyes focusing more on the whole than on individual pieces. It’s also a great solution for really vast wall-spaces too. This is a trend that is definitely replacing the use of single, huge-scale single artworks. Unlike the fashion industry, however, trends move more slowly in art, so the investment would have long-term aesthetic value. This stunning bespoke artwork – ‘A Tying of Knots’ by Debbie Smyth – at The Great Northern Hotel is a site-specific sewn piece portraying a city in transition; referencing Ordnance Survey maps from bygone years to heat maps charting interaction in the age of the internet. What key trends do you see emerging over the next 12 months? One emerging trend that we very much like is the juxtaposition of old and new, with some hotels choosing to mix a few highly-contemporary pieces with, for example, old etchings or prints. As we have access to world-renowned galleries and archives, such as the British Library and the National Portrait Gallery, as well as to the best up-and-coming artists working right now, this makes for really enjoyable and judicious selection process. Another strong trend is for a more intelligent curation than one that is simply aesthetic or decoration-based. Again, this is something we are very in favour of; moving towards story-telling and the use of art to express history, architecture, place or to a hotel or restaurant’s brand values. This is a very fast-moving sector, where the biggest design challenge is to build a truly unique identity. This is less about newness or novelty for its own sake than the creation of a very clear and appealing ethos that reflects a sense of architecture and place and is expressed across every aspect of a hotel or restaurant’s offer, whether service and communications, interior design or art. That uniqueness then needs to be communicated very clearly to the establishment’s target audience and, in this respect, hotels in particular have certainly moved beyond thinking about simple demographics towards much clearer pictures of the traveller ‘tribes’ to whom they need to appeal. One way to meet the cost challenge of staying relevant using art is to rent or exhibit instead of buying it. This tallies with the number one trend prediction for the future just released by the World Economic Forum – ‘you’ll own nothing. Whatever you want, you’ll rent.’ When it comes to art, the rental/exhibition model means an entire art selection can be replaced every six months, which is a great shortcut to a regularly refreshed look. 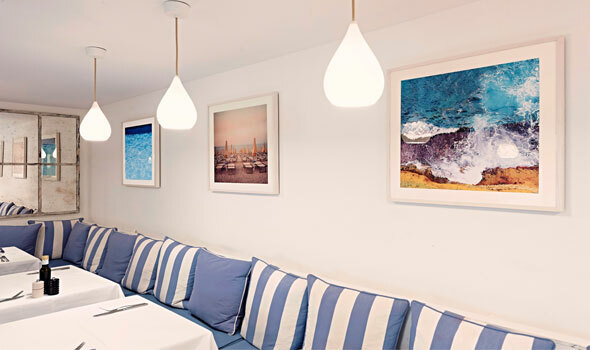 The art at Italian restaurant Casa di Stefano in Mayfair centres on the meeting of the land and sea in the Mediterranean, mixing vintage images of Italian life with fine art by Gail de Cordova – all on a rental basis, so that the proprietors can keep things looking fresh. Are you seeing a rise in hospitality establishments wanting bespoke artwork? If so, why do you think this is? Yes, we are. Bespoke artwork really underlines a hotel or restaurant’s uniqueness – a growing challenge, as mentioned above. I also think a bespoke piece can be particularly powerful as a place-making tool or expression of brand values; a distinguishing aspect over and above colour and material trends, where there is bound to be some overlap with other competitor interiors concepts. On some of the four and five-star hotels we’ve worked with this year, art has really captured the imagination of everyone on the team and we’ve had some fantastically intense, passionate and informed conversations about how to get it right for that individual establishment. 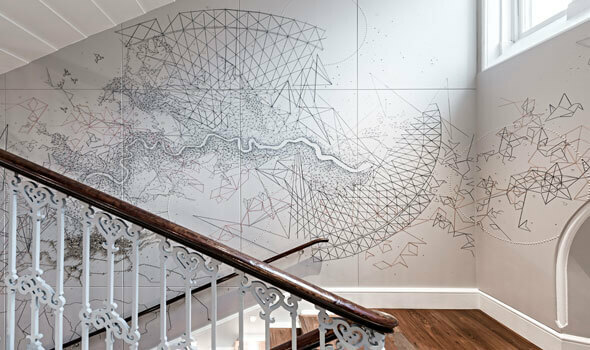 One such piece was ‘Tying a Knot’ for The Great Northern Hotel – a huge-scale piece going up a stairwell wall. There were great press and marketing opportunities to be had around having an artist in situ creating the work and talking about it to guests too. The ‘salon hang’ is a key current trend, as with this wall arrangement in the bar at The Great Northern Hotel, offering operators many advantages. Do you think that the number of establishments wanting bespoke artwork will rise in the next 12 months? Certainly. With a hard-nosed attitude, it’s worth noting that bespoke art can represent a capital investment, although of course it has to be planned for and will take more time. The wisest clients, we find, are choosing a mixture of different routes for their art – bespoke items; salon hangs and the flexibility of the rental/exhibition model to keep things fresh. When it comes to art, my advice would be to speak to an art consultant right at the beginning, where there is still time to commission, to consider all the options and to cost-save by doing that. There’s still a lack of understanding sometimes, where art is considered a final add-on, just because it is the last thing to go in in terms of the implementation process – but it should be planned for and integral to all concept and communications work from the earliest days of a scheme. If establishments have existing art that is no longer right for them, bear in mind that some art consultants can also manage the sale of that art to free up new funds. When it comes to thinking about inspiration, history is often a great place to start. Recent history may be obvious to all, but our researchers would go much further back in time and what they discover can play a great part in creating a strong narrative. For example, on one recent project in east London we discovered that the building had been used both as a bell foundry and as a factory for Huguenot weavers, whilst another had its origins in Roman times as a bath or spa. The local history of outdoor pursuits and pride in Scottish inventors informed the art curation for The Gleneagles Hotel, whilst a project in London’s Maida Vale took inspiration from its proximity to Abbey Road and The Beatles. 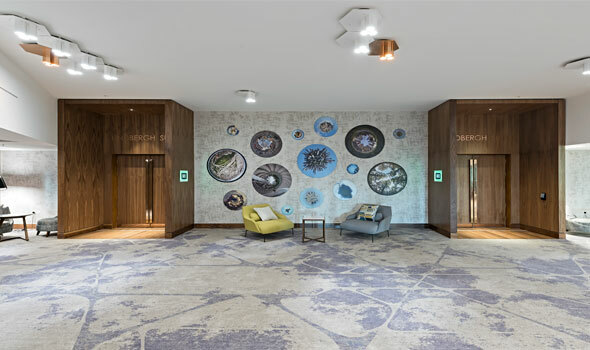 For the Banqueting & Events space at Marriott Heathrow, aluminium circles featuring 360° fish-eye-lens images of cities and parks all over the world are just part a truly interesting art strategy aimed at making visitors ‘think or laugh’ and at taking hotel art to a new dimension. Embrace change! Artwork trends do not change as often as interiors trends, but they do change, so don’t be afraid of taking that on. Again, look at renting to lower the cost outlay. Do you have any words of wisdom for establishments looking to hire an art consultant? A good art consultant will understand your brand, but will also push you. Anyone can suggest adding some moody black and white pictures of local buildings and bridges. You should set your aspirations higher and look for the added value that comes with proper, well-thought-out curation: relevant, bespoke and exclusive art that gives your establishment the added kudos of being real patrons of the arts. For more on the movers and shakers of the hospitality industry, keep your eyes peeled for the Hilden Style Guide 2017. Coming soon.